The perception of college financing and affordability is a grim one, fueled by the very real rising costs of higher education, as well as media coverage of how much students and their families are borrowing. While this perception is understandable given the realities of paying for college, how do students and parents feel about the process of college financing? The debt levels they expect to take on? The award packages they receive? Three out of four were satisfied with their aid packages. Nearly nine out of 10 mostly understand the costs related to their financial aid award. One in three say they will borrow $20,000 or less, and one in five do not plan to borrow at all. However, there are still significant challenges for students regarding paying for their education, as well as challenges for institutions in awarding aid, communicating with students and their families, and ultimately bringing in their class. How can you address these challenges and create a financial aid awarding process that aligns with student expectations and positions your institution most favorably? The full report dives into the research in depth, but there are also five key findings that can help you engage students and their parents about college financing, financial aid, and the value of a college degree. Students told us that they prefer to receive communications about financial aid across a variety of channels. Cost was tied with financial aid as the second-most important factor in choosing a college, with two out of three students citing it. Because cost is so important, it’s crucial for institutions to know where they stand versus the competition, how they are priced in the market, and what students perceive of a school’s tuition structure. By using research like RNL’s price sensitivity analysis, you will be able to see where you rank in all of these categories. Most importantly, you’ll learn how students value the education you offer. Three out of four students have used a cost calculator, and nine out of ten who did found cost calculators helpful. However, not all cost calculators are customized so that students can see the complete menu of financial aid available to them—which can impact perceptions of affordability with students. Your net cost calculator should be customizable to items like majors, student demographics, academic ability, specific institutional merit awards, and other factors in order to provide a true estimate for students and parents. This enables users to better calculate what they may need to borrow, so it has a direct link to financial aid. Providers like RNL have created net cost calculators that go beyond the simple, standard one provided by the federal government. Nearly nine out of 10 students said their parents were involved in the financial aid process. Engaging parents can help address affordability concerns and also make them advocates for your institution. The report also showed that there is a disparity between first-generation and non-first-generation students regarding parental involvement. To cast a wider net with your financial program, it’s important to communicate early, often, and continually throughout the process for audiences who may be getting varying degrees of parental assistance or knowledge of the financial aid process. This will keep families less familiar with financial aid in the loop. Colleges and universities can’t compete on price alone. Nor can they compete on brand alone. Students and parents must be convinced of the value your school delivers. In other words, “This school may cost more, but what I get out of it is worth more.” All of your marketing communications must stress this value proposition in order to achieve your goals. 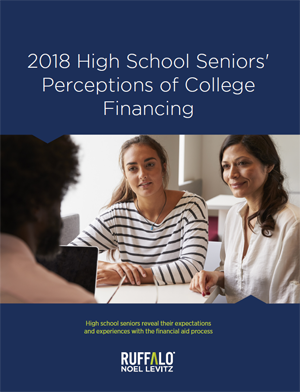 Download the 2018 High School Seniors’ Perceptions of College Financing Report to get a complete view of how students approach the financial aid process and paying for college. The report contains numerous insights on how to better position your institution, communicate with students and parents, and address concerns about affordability. You can also talk with our financial aid experts about awarding and communication strategies. They work with hundreds of institutions every year and can help you optimize both your awarding and engagement of students during the process. Ask for a consultation.